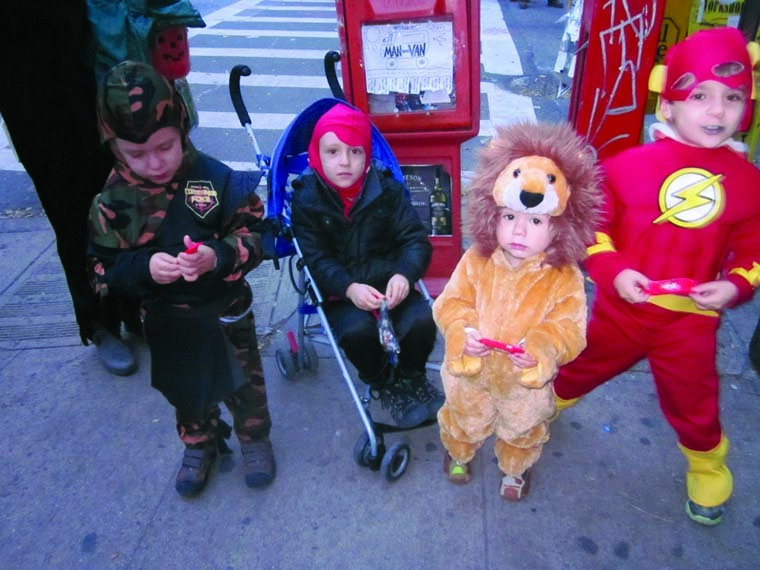 New Yorkers were out living life, trick-or-treating after Superstorm Sandy. As I write from the safety and luxury of my Manhattan hotel, it’s 24 hours after hundreds of New Yorkers and New Jersey residents discovered their homes were destroyed by fire or submerged in water, their businesses gone with the wind, their lives turned inside out till further notice. We came to N.Y.C. for a wedding and we danced and dined with Happy Blitt and David Lombardy as they began their lives together, officially, on Sunday evening before Hurricane Sandy could interfere. We had already been told our flight for the next day would be cancelled but at that point all we could think about was enjoying the celebration we had come to witness. My bad cough had kept me up the entire night before the wedding, but luckily, I made it through the ceremony without coughing and enjoyed a few dances, a sumptuous meal and observing a couple in love. Monday night, Sandy unleashed her fury. Tuesday morning we discovered there was no electricity south of our street (West 26th). Lower Manhattan was in darkness, Wall St. closed, subways flooded, hundreds of yellow cabs under salt water, a wall blown off an apartment building on 15th St., exposing living rooms to the wind. Luckily, those tenants made it out in time. As we ventured out to find a doctor who helps travellers refill prescriptions (my cough was still my worst problem) New Yorkers were lined up outside the closed Starbucks, taking advantage of the WiFi connection with their smartphones. The TV blared on all channels with photos of valiant mayors and governors, almost in tears, assessing the damage and promising relief. This was Katrina but smack dab at home. Debris littered the streets as people hurried around trying to find an open café. Mom and Pop takeout buffets served up everything you can imagine while such larger chains as Whole Foods, Starbucks and Macy’s remained closed. We wondered how anyone had made it in from the boroughs to work. This is a city that lives on its transportation system and it’s hard to imagine how it could continue to thrive when people couldn’t get to work. Not everyone can afford a cab. Who could prepare for the onslaught of the greatest storm in the history of the Northeast at a time when we humans are so reliant on artificial resources? Twenty-four hours after the storm, 8 million people were still without electricity and water. I worry about the children. Forty-five babies were born in N.Y.C. during Sandy, a deceivingly cute name for a deadly lady. Premature newborns, unable to breathe on their own, were carried down many flights out of NYU hospital in lower Manhattan. Frightened toddlers in their parents’ arms witnessed what some compared with Dresden after the Second World War. Some don’t have homes to lose. The already-homeless know how to protect themselves with layers of garbage bags, taking refuge in the corners of buildings and inside the huge pharmacy on 35th St. and Broadway, where we visited the young doctor who tended to my cough, for $160. Yes, it’s good to have a bit of money in times like these. We saw tremendous camaraderie in the Big Apple. People were kind and generous, smiling, even laughing through it all, offering as many salad choices as we wanted at the Fresh and Co. down the street, the hotel staff happy to serve us for an extra tip, the young police woman outside Penn Station laughing at our ignorance in assuming Amtrak would soon be running again. This storm has cost us a fortune, at $300 a night for this Hilton in the Fashion District, a bargain compared with what some have had to pay. But we still have our home, our business, our lives. We are among the lucky who can return to their cities, far from the maddening storm. But then, who knows what tomorrow will bring? What is happening to our world? a CNN broadcaster asks. It takes a storm like Sandy to show us that life is precious … and absurd! When one of the biggest and most influential cities in the world is brought to its knees by natural forces, we have to ask whether we’re a touch too dependent on unnatural forces. I had hoped President Barack Obama and presidential candidate Mitt Romney would contribute some of their ad millions to people who lost their homes and businesses in this area. It would have been a nice gesture. And who’s watching those ads anyway? Be the first to comment on "Superstorm Sandy: It takes a storm to show us how precious life is"